This fast-cut marine compound removes heavy oxidation and wet sanding scratches from fiberglass gelcoat. Step 1 in our comprehensive marine polishing system that removes oxidation, restores color and shine, and ensures long-lasting protection. When fiberglass gelcoat acquires a chalky, badly faded appearance, it is due to a combination of exposure and a lack of finish maintenance. All-in-one treatments that promise to clean, polish, and wax in a single step are simply no match for heavy oxidation. At best, you’ll have spent as much time and energy for marginal results. 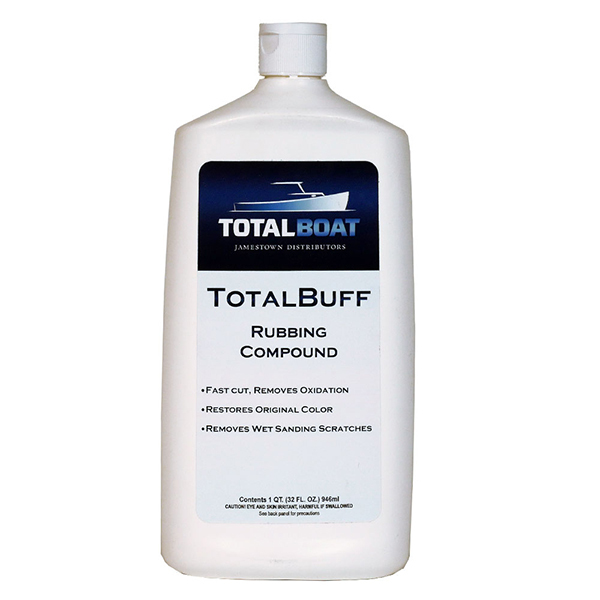 Pair TotalBuff with an electric buffer and the right wool buffing pad to remove heavy oxidation and bring back your boat’s original hull color. Follow up with TotalShine finishing material to polish, and finish the job with TotalBoat Boat Wax. We’ve developed the same type of multi-step system professional boatyards use. TotalBuff is the first step in our 3-step system. This heavy duty rubbing compound brings back the original color by removing heavy oxidation. Apply with a polisher and wool buffing pad for optimal results. Follow with TotalShine for maximum gloss, and then TotalBoat Wax for extended protection (both sold separately). 1. Compounding TotalBuff Removes heavy oxidation and scratches; restores color. 2. Finishing TotalShine Further restores color; provides a glazed, high-gloss finish. 3. Waxing Premium Boat Wax Deepens the shine and provides extended protection against UV radiation, oxidation, dirt, and salt.